I even have a research study to go with it, so pour yourself a cup of coffee and put on your geek hat. If you’re not in the mood for my take on liquid lubrication or the good and bad of caffeine, you can skip right to the recipe. Scroll away, I’ll never know. But you might find this interesting. It’s cutting-edge (okay, just edgy) stuff from a group of researchers at the University of Queensland in Australia. Their multiple experiments revealed that not only does caffeine increase attention, information-processing, and the twitchy jitters, it also makes us more susceptible to influence. We can be persuaded to change our minds more readily if we’ve been drinking coffee. We’re more gullible. And all this time I thought it was wine that made me do stupid things. Just think, we can start and end the day by being persuaded to do something we might not normally do. Caffeine-mediated arm twisting followed by wine-induced lack of judgement. 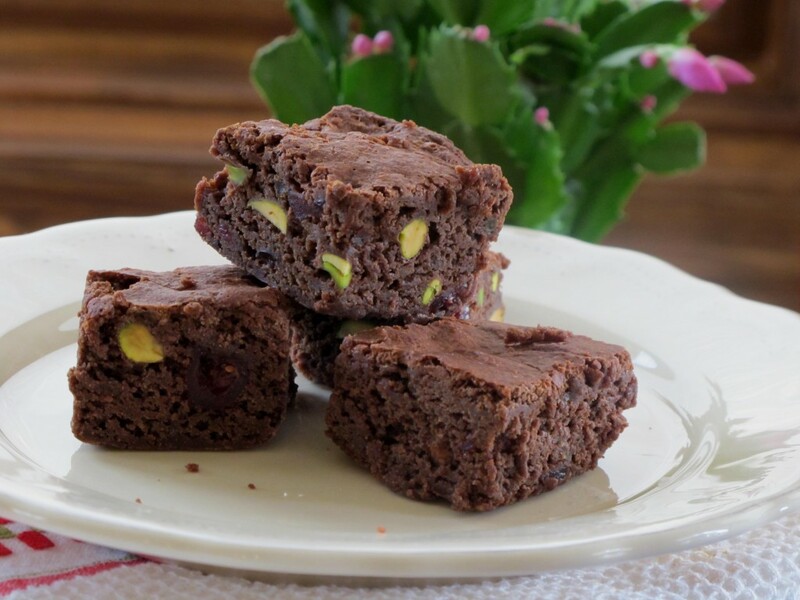 Now that you’ve had that cup of attitude-adjusting coffee, can I interest you in a brownie? They’re delicious and full of dark chocolate flavor. In fact, they’re even moderately healthy. What do you think? I know you want one. They’re gluten-free. Were you persuaded? If so, you can pick up the recipe at the end of the post, but first I’m going to give you my take on coffee drinking. You might be surprised, especially coming from a kale-eating, yoga-practicing, holistic nutritionist. 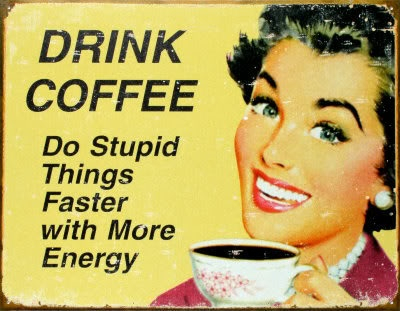 Caffeine: the good the bad and the stupid. We’ll start with the good (sort of). • Caffeine makes you more susceptible to persuasion (see above study). You might get talked into buying a purple, metallic, PT Cruiser or a tight, leopard-print, mini-skirt. You might even say yes to taking on a project you have no time or interest in. • A Starbucks Venti Peppermint White Chocolate Mocha is 700 calories! Yes, 700 calories. • A coffee grande from Starbucks contains about 550 mg of caffeine, almost 3 times as much as a NoDoz. The half-life of caffeine in the body is around 6 hours, so if you drink a 200 mg cup of coffee at 4 PM, at 10 PM you will have 100 mg of caffeine floating around your system and blocking your adenosine receptor sites. That will mess up your sleep cycle, which is not good. Bottom line? There are some good things about coffee, so like everything else in life, moderation is the key. One cup of coffee in the morning is fine. If you “need” it to wake up and “need” it throughout your day, that is bad. Choose a high-grade, organic coffee and enjoy a cup on occasion (unless you’re hypersensitive). 1. Line an 8-inch square baking pan with nonstick aluminum foil. 2. Pour water to the depth of a couple of inches int to the bootom of a double boiler over medium heat. Bring to a boil, reduce heat to a simmer. Place coconut oil, chocolate chunks and coffee granules in the top of the double boiler over the simmering water. Cook, stirring occasionally until melted. Remove from heat and let cool. 3. In a large mixing bowl, beat eggs on low speed. Add puréed beets, sugar, vanilla and salt; beat until blended. Stir in chocolate mixture and fold in Pamela’s mix. Stir in pistachios and cranberries. 4. Pour into prepared baking pan, spreading batter evenly. Bake in preheated 350 degree oven for about 30 to 32 minutes or until toothpick inserted in center comes out with only a few crumbs. Cool on wire rack. Cover and refrigerate for 8 hours or overnight. Cut into squares and serve. Store in an airtight container in the refrigerator. Like coffee, these little treats have caffeine, so don’t eat them before bed, although I’m not suggesting eating them for breakfast either. Hmmmm? Life can be full of dilemmas. * I used 1 and 1/2 bars of organic Chocolove 61% dark chocolate (one bar is 3.2 ounces). Check here for details. * I used Mount Hagen organic instant coffee, but any will do. You can buy Mount Hagen by the jar or in single serving packets. I love the single serving packets for backpacking (seriously wonderful stuff). Check here for details. Peace, joy and persuasion (the good kind).